Weight : 1004g per pair in size 8.5. Traction : Essensole rubber sole with 5mm lugs. Self-cleaning. Cushioning : full-length EVA insert = joint protection. 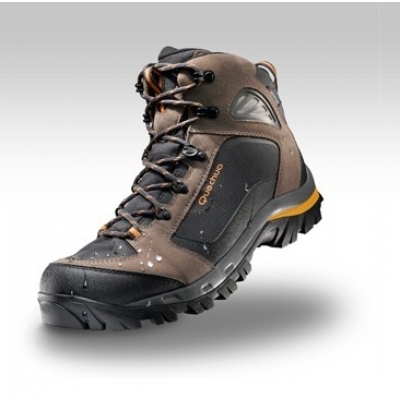 Waterproof : Novadry membrane: Waterproof and breathable.The Forclaz 500 Men's boot is waterproof for 4000 flexes. Support : 2 hooks on the top of the upper: good ankle support. Compatibility : Full-length EVA midsole = joint protection. Composition : polyester and split leather upper; EVA midsole, rubber outsole. Care Instructions : Do not machine wash. Wash in soapy water with a brush. Do not tumble dry. Do not dry near a heat source.